Oddball Stocks: Is Huntington Ingalls cheap? A spinoff is when a company decides that a portion of itself might operate better as an independent company so it splits itself apart and the two or more companies begin to operate separately. Investing in spinoffs was popularized by Joel Greenblatt in his book "You Can Be a Stock Market Genius". Recently it seems that investing in any and all spinoffs has become quite the rage, and while I love market beating returns as much as anyone investing indiscriminately doesn't sit well with me. In light of this I decided to take a look into the most recent spinoff Huntington Ingalls. For more than a century, we have been designing, building, overhauling and repairing ships primarily for the U.S. Navy and the U.S. Coast Guard. We are the nation’s sole industrial designer, builder and refueler of nuclear-powered aircraft carriers, the sole supplier and builder of amphibious assault and expeditionary warfare ships to the U.S. Navy, the sole builder of National Security Cutters for the U.S. Coast Guard, one of only two companies currently designing and building nuclear-powered submarines for the U.S. Navy and one of only two companies that builds the U.S. Navy’s current fleet of DDG-51 Arleigh Burke-class destroyers. We build more ships, in more ship types and classes, than any other U.S. naval shipbuilder. We are the exclusive provider of RCOH (Refueling and Complex Overhaul) services for nuclear-powered aircraft carriers, a full-service systems provider for the design, engineering, construction and life cycle support of major programs for surface ships and a provider of fleet support and maintenance services for the U.S. Navy. With our product capabilities, heavy industrial facilities and a workforce of approximately 39,000 shipbuilders, we believe we are poised to continue to support the long-term objectives of the U.S. Navy to adapt and respond to a complex, uncertain and rapidly changing national security environment. The best place to start with in looking at Huntington Ingall's business is under the lense of Porter's five forces for competitive and business analysis. The five forces examines different threats to a business or industry and by doing so can help an analyst realize potential strengths or weaknesses. Threat of new entrants - There is very little to no threat of new entrants in the government contracted ship building business. I believe there are two reasons for this, the first is the capital and knowledge investment is too big, and secondly the profits for that investment in resources is very small. There are currently two major players in the shipbuilding market, and if a third entered it's likely that none of the three would be able to be profitable. Bargaining power of suppliers - This is not much of a threat, this force can be threatening when suppliers are concentrated. In the case of Huntington Ingalls they deal with hundreds if not thousands of suppliers for the raw material they use to build their ships. In some instances the supplier might be concentrated in the case of a specialty part, but even in that case it's not threatening to the business. Bargaining power of buyers - This is a major threat to Huntington Ingalls, they only have one buyer the US Government. If the government decides to reduce defense spending or stop building ships Huntington Ingalls will be unable to continue as a going concern. Threat of a substitute product - A good example of when this threat might apply is in the case of an iPod being a substitute for someone going to a concert. At first glance it seems this threat might not exist for Huntington, but I believe it does. A substitute product could be that instead of building light ships to patrol costal waterways the military begins to purchase drones which are far cheaper. A change in military strategy away from heavy navies would be a substitute product. Rivalry amongst existing competitors - This is a threat but not a large one. There is only one other company who does the same work that Huntington does and they are competing for a range of products that accounts for 32% of Huntington's revenue. Taking a look at the total it seems Huntington gets a 2.5/5 which isn't bad. What makes Huntington interesting is they hold a mostly monopoly position on their market. While that's great that they have a monopoly what isn't great is that the monopoly is on a mediocre business. It's like the old saying "He's a giant among trolls". Huntington Ingalls has a great business in the sense that they have a proven backlog of projects, they are the only company who is able to execute on the projects, they have experience in the marketplace. The current business backlog is $18.5 billion dollars, which at their current revenue run rate is about 2.8 years worth of worth. What attracted me to this spinoff is how great the business is, it's very steady and predictable, and it's a monopoly. When I first heard the details I was excited, I felt Huntington Ingalls was a perfect business what could go wrong with buying a monopoly? What can go wrong is an investor can pay too much..
Just a few notes before I start, in my income statement worksheet I removed the goodwill impairment in 2008. Secondly I built out my spreadsheets using the filing, information from the credit rating documents, and the pro forma statements the company provided. I'm saying this because if you do a 3 minute check some of my numbers don't appear in the filing, this is the analysis part of my research. The biggest issue is that the company is highly levered. The company has gross debt to EBITDA at the end of 2010 at 7.25x. What's interesting is the credit rating agencies expect Debt/EBITDA to be 3.5-4x in 2011 which gives us a bit of earnings insight. I put together an income and cash flow worksheet with the data they provided, I have it below. The first thing that stuck out to me is the margins are terrible, they had a net margin of 1.41% in 2010, this is plainly a capital intensive business. The company spent $1 to make $1.01 which is not a very good deal. Even if we look at the last five years the highest their net income margin peaked was in 2007 which it hit 4.85%. Over the last five years the company has experienced revenue growth of 4.8% but net income hasn't kept up, it actually has been falling. The company defines free cash flow as cash from operations less capital expenditures. This is a generally accepted method for calculating FCF, I would prefer maintenance expenditures but that value isn't broken out at all. I will usually also normalize cash flow, but in Huntington Ingalls case this wasn't necessary because their cash flow items remain very steady. There are few working capital changes from quarter to quarter and year to year which is a byproduct of the government business. I include two calculations, the first is what most analysts would consider ROIC, the second considers purchase obligations as well. It's usually enough to only include operating leases but in Huntington's case they have contractual purchase obligations that they must honor regardless of the business environment, in this situation it's much more like debt. As you can see in either case the ROIC is not very good, both are less than their cost of debt (7% on the notes) and much less than their cost of capital. This is not a good sign, this means that the company is consuming resources unproductively, they are borrowing at 7% to get a 2.42% return. The result shouldn't really be a surprise, the profit margin is small, they make effective use of their assets turning them more than once, and finally the ROE is juiced by the leverage. I thought about the question are the shares cheap a few different ways, I'll break those down into scenarios. If the company continued to grow at the 4.8% rate and nothing else changed this is not a good investment. The reason being that they're not covering their cost of capital or earning a good return for shareholders. A shareholder would be better off purchasing a Treasury bond, they would earn a guaranteed yield higher than the ROIC of Huntington Ingalls, and the bond is guaranteed. As you can see even a small savings of 2% bumps the gross margin above 5% and the net to 2.59%. But a bigger savings of 5% gets the net close to 4.5% which is in respectable territory. At the 5% savings level I estimate the ROIC would stand around 8% which would still be less than it's cost of capital, but at least greater than it's debt. Which of these scenarios is likely? Based on what the company told the credit rating agencies I'm led to believe they expect to achieve around 5% cost savings in 2011. At the 5% savings level Debt/EBITDA is at 3.2 which is what the company said would be likely. At the 5% savings level their ROE would increase to 21% as well. Another measure of cheapness is to look at where the shares are trading today with price divided by the last five years earnings average. With this measure the shares are trading at a P/E5 of 12.62 which isn't all that high. If the company is able to hit their cost reduction targets it could earn them 302m in 2011 which would be EPS of $6.10. Assuming no multiple expansion the shares would trade at $76. Huntington Ingalls isn't a risk free investment, even though their contracts are guaranteed and they have a monopoly on the market there are two issues that I see as the biggest risks. The first is government funding for defense initiatives. As of now funding is guaranteed through 2012, but it's anyone's guess what happens after 2012. If the Congress or President decides to cut defense spending Huntington will feel the pain, and with the large debt load their survival could be at risk. The second risk is the issue of liabilities specifically environmental liabilities. Building ships and refueling nuclear vessels is not a clean task. Disclosure: I do not own any Huntington Ingalls shares, but I'm considering purchasing them in the next few days. Interesting analysis. I do think you kind of missed the big picture on investing in spinoffs, though. You are not looking for an excellent company as much as an excellent price. Here, one would think there would be a lot of forced selling as holders of NOC dump the HII shares they received in the spinoff. There should be a lot of forced selling by index funds in particular as NOC is a member of the S&P 500 and HII is not. That being said, I still don't find the price attractive at this time. Thanks for the comment. I agree that the goal of a spinoff is to find an undervalued opportunity, but I think the only way to know that is to know the business. Not all spinoffs are plated in gold, some which appear cheap are actually expensive, like Idearc spunoff from Verizon. Verizon was dumping a money losing yellow pages business, without examining the business there is no way to know if the price is good. A second prong of spinoff investing is that fact that now as a standalone company management has a different motivation and incentive to perform. In the case of Huntington Ingalls I believe this motivation will result in margin improvement. Actually you don't need to believe anything, if you read the management roadshow they tell you as much, they also state how they expect margins to improve per year. If management can execute on their goals the stock will either become extremely cheap, or appreciate in value. A third point, I recognize the forced selling issue, but in this case HII was added to a MidCap index, so while the S&P funds were selling the MidCap funds were buying somewhat muting the effect. 1. where did you find out what the company told the rating agencies about their expected 2011 cost savings? 2. how did you calculate last 5 years average earnings (the 10 form lists only 3 years going back)? If the link doesn't work, go to their website, and click Investor Relations, then Presentations, and then Archived Presentations. In your scenario 2, why not use adjusted ebit instead of operating income (which is affected by the avondale closure costs), as the starting point? 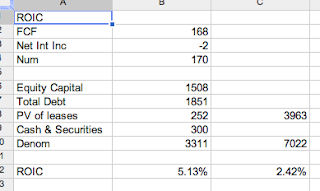 Just habit I guess, I usually use operating income, so my spreadsheets are set up for it already. In general though I shy away from adjusted ebit/ebitda numbers, in my experience the adjusted always seems to change a little bit so management can hit their targets, a number like operating income is fixed so it's an easier target to benchmark from.